WWF is implementing two pilot projects in West Nile aimed at protecting water sources so as to safeguard the health of people and reduce the costs of water treatment. WWF is working with the Rural Initiative for Community Empowerment (RICE), the World Bank and National Water and Sewarage Corporation to improve the water quality R. Enyau through river bank restoration, stabilization and community sensitization. This work is being carried out under a project titled 'Implementation of priority source protection measures on river Enyau'. 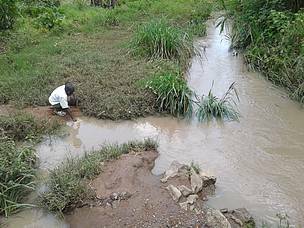 Activities such as farming close to the river bank, car and motorbike washing in the river have been the biggest contributors to the water pollution in this catchment. To counter these vices, WWF together with RICE have held community awareness meetings to inform people about the benefits of proper management of R. Enyau. Youth involved in car and motor washing are being relocated or supported to adopt alternative livelihood activities that are more environmentally friendly such as fruit growing and nursery bed establishment. The areas with heavy pollution from washing bays have been safe guarded with the construction of gabions to reduce the amount of water pollutants such as soap, oils and heavy metals from car and motor washing. Under the project, Bamboo and napier grass will be planted along the river banks for stabilization of the river bank and enhancement of the ecosystem. These interventions will reduce siltation in the river, provide clean water to the communities and reduce water treatment costs for NWSC. The restoration of R. Enyau starts from the source of the river to the National Water and Sewerage Corporation (NWSC) water abstraction point. Three hundred households with plots within the 30 meter buffer of R.Enyau are the direct beneficiaries of the project.